Yet another thing for the JMU 3-SPACE classroom: some cheese to keep the door open. 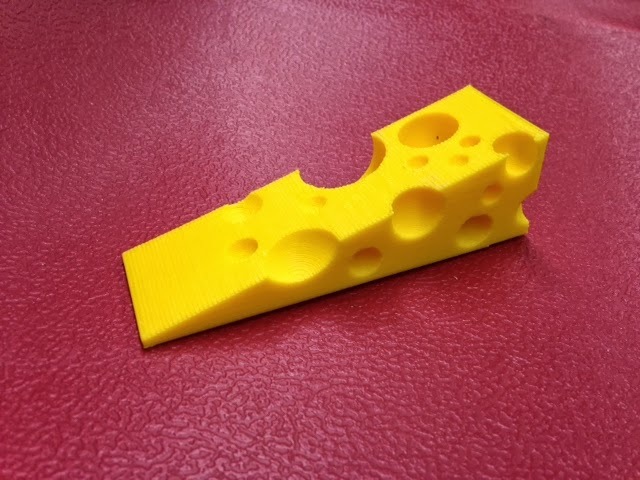 Design from terenceang's Cheeze Door-Stop remix of mpv4gb's Swiss Cheese Doorstop on Thingiverse. Settings: Afinia .3mm fast. Some of the circles came out rough but since it is on the floor I don't think anyone will notice. Technical notes: I printed it scaled down 75% so it would fit easily on the Afinia build platform. It's a little smaller than a typical doorstop but fits nicely under the door and people won't trip over it. It sort of looks like a small square of cheese when in use since most of it is under the door.